The Dutch Thrash Metal formation LEGION OF THE DAMNED has been around for almost 10 years (since 2005). Under that monniker they’ve so far released six full length releases. Before changing the name, they were known as OCCULT, a name I heard a few times when I was in my teens, but never bothered to check out properly. It’s only when “Sons Of The Jackal” (2007) came out that I decided to hear what LOTD had to offer. Although I liked what I heard, it didn’t convince me to acquire the next albums, also because my favourite subgenre in Metal remains Power Metal, and I only listen occasionally to the more extreme versions (Thrash, Death, …) when I’m in need of an energy boost, for example. Furthermore, there are other bands in these genres that more easily draw/drew my attention. Nevertheless, in 2011 “Descent Into Chaos” came out. This time the band asked Peter Tägtgren (HYPOCRISY, PAIN, …) to play with the buttons, and I liked it even more. The sound was more polished, but also not as raw or scraping as what Andy Classen is known for. Even if Andy has produced most of LOTD’s albums. And so, because of the good work he did in the past, LOTD returned to Stage One studios to work on their sixth album, “Ravenous Plague”. This one came out in January via Napalm Records. In addition, there was (another) line-up change: guitarist Richard Ebisch, known for his focus on heavy, razor-sharp riffs, was replaced by Twan Van Geel (BUNKUR, FLESH MADE SIN), who joined the band in 2011. Part of his duty was/is to put more melody and diversity into the songs. And maybe because the production on “Descent Into Chaos” was a bit too soft compared to previous efforts and/or due to the line-up change, the band decided to not only return to Andy Classen, but also write heavier, ballsier tunes again. “Ravenous Plague” is chock-full of those. But it all starts with a cinematic intro, “The Apocalyptic Surge”, written/composed by Jo Blankenburg, known from his work for films like “Harry Potter”, “X-Men”, and “300: Rise Of An Empire”. Then all hell breaks loose in “Howling For Armageddon”, a song that attacks directly. It’s fast, it pounds, it’s aggressive. Add Maurice’s typical, vile and ferocious vocals and you’ve got another LOTD song that fits perfectly among the rest of the discography. Somehow it made me think of old METALLICA (“Kill ‘Em All”) and a bit of MASTER (the Death Metal veterans). There is indeed room for leadwork, but it’s not coming out much, as the guitar just appears to be screaming. Around halfway is a better example of Twan’s input as the music becomes more melodic. “Black Baron” is another song where instant killing is key. Fast Thrash, to the point and GO! Who needs an intro and building? Nah, Thrash is/needs to be direct, aggressive and more along these lines. Also, stamina is of vital importance. Around halfway the bands grooves away at midtempo pace, sounding a little Death Metal-ish. Scream guitar bits spice things up a little before the pedal is pushed back to the metal. Killer stuff! “Mountain Wolves Under A Crescent Moon” begins with typical Thrash riffing, building with drums bursts, after which all power is unleashed! The typical humppa/skank beat, so tasty, so catchy. The fast double kickdrums soon take over, though. The rhythm guitar, the scratching (by lack of a better term) sound stands out here. All things considered, this could have been a DESTRUCTION song. Halfway the pace slows down a little, in favour of midtempo and a guitar solo. Yes, a solo, something that was extremely rare (if not totally absent) on previous LOTD albums. All ends with wild leadwork. “Ravenous Abominations” has a short intro, followed by another round of humppa Thrash: relentless, aggressive, diabolical. Definitely not for the faint of heart or mind. As before, the fast tempo drops a little to midtempo, which seems to be a recipe the band applied on several songs. The (wild) solo is reserved for the last part of the song. All ends with sad leads and a clean rhythm lick. “Doom Priest” commences with a dark and haunting intro, transcending into rolling, thundering Death/Thrash. Like before, quality assured. Twan’s melodic input also can be detected in “Summon All Hate”, a song set in midtempo pace. Like before, it’s got a catchy, rhythmic chorus, ideal to sing along to. And there’s also a guitar solo; not in the chorus, obviously. “Morbid Death” is another uptempo pounding Thrasher in DESTRUCTION style. The chorus is straight-forward. This song also features a guest solo by Hein Willekens, who is the band’s second live guitarist. If there’s only song I was allowed to pick as favourite or highlight, it’s “Bury Me In A Nameless Grave”. It begins like a Thrashy Heavy Metal song and gradually the tempo increases, Thrash takes over. Like the goal was to start slow (so to speak) and end fast. From start to finish, pure mastery! More double bass-ed Thrash attacks can be found in “Armalite Assassin”, which also features melodic guitarwork, and a solo halfway. Last but not least, there’s “Strike Of The Apocalypse”. Here you get slow/midtempo Thrash, though the typical LOTD pounding kicks in later. 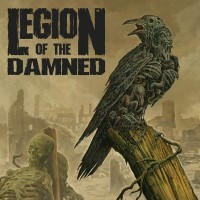 With a new line-up and a new, more melodic album, yet restoring the amount of aggressiveness (also thanks to Andy Classen), LEGION OF THE DAMNED have confirmed their status as one of the best Death/Thrash bands currently active. “Ravenous Plague” is an album full of powerful, ferocious and aggressive sounds that has the ability to distort your mind and feelings. Recommended material! 2014 has started well in the Extreme Metal domain.